Still rockin’ the air cast, and more awesome hand-knit socks. I couldn’t get an appointment with the orthopedist until the 15th, which is frustrating. Meanwhile, being off the foot helps a lot, as much as I hate crutches. I’m pretty fast on them–lots of experience from when I was a gymnast–and I’m gonna be awesome at push-ups after this. I had an appointment with a chiropractor yesterday, and I really like him. He had some trouble fully evaluating because I can’t stand normally, but he still figured out way more about my back pain than anyone else I’ve been to. Apparently when I stand or sit, I tend to hold my rib cage forward more than I should, which creates a backward bend in my lower back. Over time, that wears on those facet joints and causes pain. My hypermobility is also part of the issue, which doesn’t surprise me. Because my pelvis and spine move more than most people’s, I lack core stability. He said I have plenty of core strength, but I have to start engaging it more actively than most people (i.e., consciously tuck my rib cage back). He gave me a bunch of exercises that make way more sense than the ones the physical therapists gave me–I think the PTs weren’t properly trained to account for my degree of hypermobility. 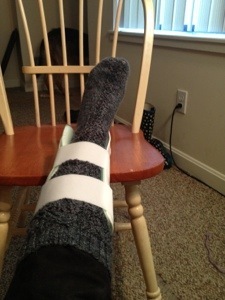 He thinks my foot is probably a cumulative tendon or ligament injury–again, due at least partly to my hypermobility. I over-supinate–when I walk or run, my feet roll to the outside. This is uncommon; most people with step issues over-pronate (roll to the inside of the foot). The mobility of my ankles and my high arches contribute to this. I may end up needing ankles braces, and he said I definitely need more flexible walking/running shoes. It’s just so nice to finally get a comprehensive explanation of what’s going on with my body. I don’t like having all these problems, but I feel hopeful that this new chiropractor can help me sort it out. Sorry you are in such pain. You’re post title caught my attention because I have hypermobility too, and a while ago I had incredibly painful injury to my ankle, and couldn’t walk on it. Nothing showed up on the scans, because they kept looking in the wrong place. I had actually snapped a ligament on the inside of my ankle, which is fairly rare to do, but it was because of my hypermobility issues. It sounds like your chiropractor is on the right track, but I just wanted to tell you because it took months for them to find my injury, and many months to be able to walk without a brace. I hope it all gets sorted quickly for you. Take care, and do your exercises!